Results from experimental studies have established that it is no longer realistic to examine the effects of climate change on crop and forage plants without also accounting for the direct effects of rising atmospheric CO2 at the same time. The short-term responses to elevated CO2 of isolated plants grown in artificial conditions remain difficult to extrapolate to crops in the field (Korner, 1995). Even the most realistic free-air carbon dioxide enrichment (FACE) experiments yet undertaken impose an abrupt change in CO2 concentration and create a modified area (Kimball et al., 1993) analogous to a single irrigated field in a dry environment. Natural ecosystems and croplands are experiencing a gradual increase in atmospheric CO2. Nonetheless, a cotton crop exposed to FACE increased biomass and harvestable yields by 37 and 48% respectively in elevated (550 ppm) CO2 (Mauney et al., 1994). At the same CO2 increase, spring wheat yields increased by 8-10% when water was non-limiting (Pinter et al., 1996). A simple linear extrapolation of spring wheat FACE results to a doubling of CO2 produces a 28% increase in yields. Several important breakthroughs in the understanding of CO2 direct effects on crops were accomplished since the SAR. Most concern improvements in the understanding of how climate interacts with the physiology of CO2 direct effects. Horie et al. (2000) found that moderate temperatures accompanied by a doubling of CO2 increases the seed yield of rice by 30%. However, with each 1 ° C increase in temperature above 26 °C, rice yield declined by 10% because of shortened growth period and increased spikelet sterility. This raises concerns that CO2 benefits may decline quickly as temperatures warm (established but incomplete). On the positive side, crop plant growth may benefit more from CO2 enrichment in drought conditions than in wet soil because photosynthesis would be operating in a more sensitive region of the CO2 response curve (Samarakoon and Gifford, 1995). Significantly, this effect was observed in C4 photosynthesis. The most likely explanation for this thus far is that drought-induced stomatal closure causes CO2 to become limiting in the absence of CO2 enrichment (established but incomplete). It is not clear how much this effect is likely to offset the overall effect of drought on crop yield. Also, the notable dearth of testing of tropical crops and suboptimal growth conditions (nutrient deficits, weed competition, pathogens) continues from the SAR as a major research gap. In forests, the influence of increased CO2 levels at the ecosystem level is not well understood and is, in many regions, masked by other direct and indirect effects of human activity. Most global models of terrestrial ecosystem dynamics include a growth enhancement associated with a CO2 fertilization effect on photosynthesis (Prentice et al., 2001). At the plant and plot level, Norby et al. 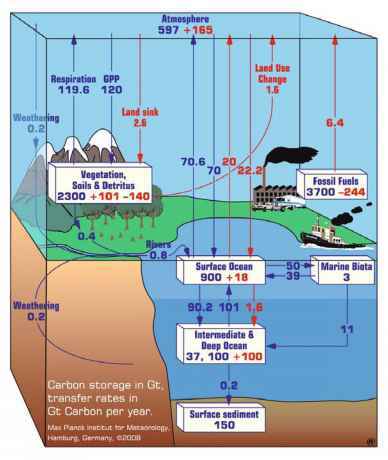 (1999) point out that saturation of the CO2 response due to acclimation of the individual plant to elevated CO2 or to other environmental limitations (such as water or nutrients) must be examined with long term observations. In their review of existing manipulative experiments, Norby et al., conclude that elevated CO2 yields continued and consistent stimulation of photosynthesis with little evidence for long-term loss of sensitivity to this stimulation. In contrast, a later study of East coast north-American forest inventory data by Casperson et al. (2000) concluded that changes in growth enhancement due to environmental factors including post industrial CO2 increases is much smaller than has previously been reported, accounting for only 2.0 ± 4.4% of the aboveground net ecosystem production of the last century. They conclude that changes in land use (abandonment of marginal agricultural land), and land-use practices (forest management) have had a far greater impact. Whether CO2 fertilization presently plays a significant role in forest biomass and fiber accumulation, the general consensus appears to be that its influence will saturate in the coming century and become increasingly insignificant in relation to other global change impacts. Unlike agricultural systems, the turnover time (life cycle) of forest vegetation is long in comparison with the rate of projected environmental change. Major advances were made since the SAR in the understanding of how changes in climate elements such as temperature, precipitation, and humidity, are likely to affect crop plants and livestock; CO2 direct effects were included in much of this new crop research. A review of 43 crop modeling studies performed since the SAR revealed important geographic differences in the predicted impact of climate change on yields (Gitay et al., 2001, Table 5.32). The studies incorporated a wide range of climate change scenarios, including several different general circulation model experiments, historical climate fluctuations, and simple sensitivity experiments. While change in climate variability, defined as change in the higher moments of climate elements, was not explicitly examined in this part of our review, it is incorporated in many of the scenarios used in the crop modeling experiments. The modeling studies were separated into tropical and temperate regions for comparison. Predicted percentage changes in yields (relative to current yields) in response to climate change from each study were plotted against local temperature increases; the crops were rice and corn in the tropics, and corn and wheat in the temperate regions. All studies accounted for CO2 direct effects but not for adaptation. Only study results based on local precipitation increase were selected for this comparison. We focused on cases of precipitation increase for three reasons: (i) to permit evaluation of the response of crops to the least stressful expected conditions as a conservative estimate of crop sensitivity; (ii) to be able to report an acceptable number of studies performed with comparable climate change characteristics - there are more modeling studies in important agricultural regions based on positive precipitation change than negative, and, following from ii, (iii) among the more discernable patterns of agreement among climate model projections reported by the TAR-WG II (Carter and LaRo-vere et al., 2001), are increases in summer precipitation in high northern hemisphere latitudes, tropical southern Africa, and south Asia, with little change in southeast Asia3. The distribution of raw modeled yields versus temperature change was converted to a log normal distribution in order to damp the distorting effect of outlier yield estimates. The logged yield values were then were averaged across studies at each degree of temperature change - i.e., yield estimates for all studies reported at, for example, +1°C were averaged to create a mean value for +1°C, +2 °C and so on out to +4 °C. The mean log yields were then converted back to their original units (mT-ha) and plotted to produce the line graphs shown in Figures 1 and 2. Comparison of Figures 1 and 2 demonstrates the relatively greater sensitivity of tropical crops to climate warming than temperate crops. In the tropics, although rice yields increase by approximately 7% above current yields with 1 °C of warming, they decline sharply beginning at 2 °C of warming, falling to 17% below current yields at the maximum of 4 °C of warming. The initial positive response of rice was heavily skewed by a preponderance of studies at the northern edges of the tropics. Rice yields everywhere else in the tropics declined with the initial 1 °C of warming. Figure 1. Corn and Rice yields versus temperature increase in the tropics averaged across 13 crop modeling studies. All studies assumed a positive change in precipitation. CO2 direct effects were included in all studies. Figure 2. Corn and Wheat yields versus temperature increase in the temperate zone averaged across 30 crop modeling studies. All studies assumed a positive change in precipitation. CO2 direct effects were included in all studies. Tropical corn yields decline by nearly 7% with the warming of 1 °C, by more than 20% with warming of 4 °C. This will pose a challenge to adequate food production in a majority of the world's least developed nations. In temperate regions, corn was slightly benefited by warming of up to 2 °C before slipping below current yields at +3 °C (Figure 2). Wheat yields tended to be less resilient in response to the climate change, slipping below current yields at warming of +2 °C, and declining to -25% below current yields at +4 °C. The greater sensitivity of crops to warming in the tropical region is partly explained by the fact that crops in this region are grown under normal temperatures that approach theoretical optima for photosynthesis, and any additional warming is deleterious, even when accompanied by increased precipitation. Temperate crops are normally cold temperature limited, and the early stages of warming, accompanied by increasing precipitation, undoubtedly stimulate higher productivity - for a while. However, as temperate warming proceeds so does evapotranspiration. At temperature increases of +3 °C or greater, evapotranspiration appears to overcome the benefits of warming and increased precipitation, leading to increasing aridity and decreasing yields. Hence, all major planetary granaries are likely to require adaptive measures by +2-3 °C of warming no matter what happens to precipitation. It would be reasonable to expect adaptive measures to become necessary at lesser amounts of warming in those regions experiencing precipitation decreases with the warming. Recent research on the impact of climate change on livestock supports the major conclusions of the SAR. Farm animals experience climate change directly by altered physiology and indirectly by changes in feed supplies. A dearth of physiological models that relate climate to animal physiology limits confidence in predictions of impacts, although model building is underway (Hahn, 1995; Klinedinst et al., 1993). However, there is general consensus from experimental results that climate warming likely will alter heat exchanges between animals and their environment such that mortality, growth, reproduction, and milk and wool production would be affected. Livestock managers routinely cope with weather and climate stresses on their animals, using techniques such as strategic shading and use of sprinklers. This bodes well for adapting to climate change. 4.2.1.1. Accounting for Climate Variability. Natural climate variability and its changes with mean warming regulate the frequency of extreme events such as drought, excessive moisture, heat waves, and the like, which are critical determinants of crop and livestock production. Carter and LaRovere et al. (2001) list several likely to very likely changes in extreme events of importance to agriculture including, for example, higher maximum temperatures over nearly all land areas and increased summer drying over most mid-latitude continental interiors (even in cases of increased precipitation due to increased evapotranspiration). Research has only begun to consider the effect of change in frequency of extremes on agricultural production explicitly. Some analysts find that increased interannual climate variability accompanying mean climate changes disrupts crop yields more than mean climate changes alone (Mearns et al., 1995; Rosenzweig et al., 2000). Stochastic simulations of wheat growth indicated that a greater interannual variation of temperature reduces average grain yield more than a simple change in mean temperature (Semenov and Porter, 1995). The potential of a change in extreme events with climate change to amplify the impact of climate change on crop productivity (both positively and negatively) is established but research is incomplete. Analysts argue that it is important that the effect of change in climate variability on crops be distinguished from that of the change in mean climate conditions as a basis for distinguishing the impacts of natural swings in climate variability from those of climate change (Hulme et al., 1999). Hulme et al. (1999) found it difficult to distinguish the impact on modeled wheat yield of simulated natural climate variability from that of simulated changed variability due to climate change. Hulme et al. (1999) compared wheat yields simulated with a multi-century modeled control climate containing realistic natural climate variability with those simulated with a multi-century climate change containing a change in climate variability. They found that yields under the control climate were indistinguishable from yields under climate change in a majority of the modeling sites. Such simulation results emphasize the need for greater efforts to distinguish the 'noise' of natural climate variability from the 'signal' of climate change (Semenov et al., 1996; Pittock, 1999). Since SAR, with the increased availability of transient GCM simulations, much more research has been focused on the transient responses of forest ecosystems to changing climate rather than the assessment of forest resources under an assumed equilibrium climate for a doubling of atmospheric CO2 forcing. Such equilibrium analyses are now recognized to give valuable insight into the likely sensitivity of forest ecosystems and vulnerability of the goods and services they supply, but are not good predictors for resource management strategies which must deal with changing forest conditions. New dynamic vegetation models (DGVMs) have largely displaced the earlier static biogeographic models (from which many derive). These new models may also be used to examine the sensitivity of global forest ecosystems to climate change, and in broad terms portray the same story as the earlier static models. They add, however, the important time dimension, and combined with increased spatial resolution provided by Regional Climate Models, permit the simulation of more detailed and realistic regional response patterns. Early examples of these new models are provided in the IPCC Special Report on the Regional Impacts of Climate Change (Watson et al., 1998) and in the Vegetation/Ecosystem Modeling and Analyses Project (VEMAP). Neilson et al. (1998) compared output for some of these models using transient climate change scenarios as input and compared the results with those reported in SAR. They concluded that the new transient GCMs produce somewhat cooler climates than the static simulations (primarily because of lag effects) but that significant poleward shifts in temperature limited vegetation types (temperate and boreal forests) are still expected. As pointed out by Gitay et al. (2001), however, these DGVMs are in their infancy, and the timing and actual distributions will be better understood when the models are both fully dynamic and feedbacks into the climate models is completed. One factor that has emerged in importance has been changes in natural disturbance regimes. In most of the seven countries containing 60% of the global forest resource, controlling fire, insect and disease impacts is already a significant part of the forest resource management portfolio. Both climate change and other global change pressures are expected to result in changes in the annual rate of areas affected by such disturbances. In the absence of directed management interventions, the changes are likely to be towards increased disturbances and there is some evidence that such increases are already occurring in boreal fire (Kashischke et al., 1995; Kurz and Apps, 1999; Shvidenko 2000) and insect outbreaks (Kurz et al., 1995; Fleming and Tatchell, 1995; Williams and Liebhold, 1997; E. Berg Personal Communication, 2002). A pressing question is whether such environmentally induced increases in disturbance rates can be effectively controlled through increased suppression effort. In the case of wild fire, which accounts for at least 2 Mha annual forest combustion in Canada (average for the 1990s), the probability of reducing this burn rate through increased suppression effort is very low, even with great increases in expenditures. Some 97% of the area annually burned is caused by the 3% of the fires that escape initial effort (which is limited by response time and the vast territories involved). Increased present rates of disturbance facilitate successional change, providing a mechanism for ecosystem readjustment to altered environmental conditions of the new climate over the long term (Overpeck et al., 1990). In the near term (decades), at some locations there may be a transient loss of resources associated with these increased disturbances as older stands are replaced by juveniles. In summary, while climate change is proceeding, the global forest resource is likely to be adversely effected due to the transient effects, and because of the relatively long life times of the vegetation, these impacts from changes taking place today will play out over a century or more into the future. The impacts of climate change will induce responses from farmers and ranchers aimed at adapting. Initial responses likely will be autonomous adjustments to crop and livestock management such as changes in agronomic practices (e.g., earlier planting, cultivar switching) or microclimate modification to cool animals' environment. They require little government intervention and are likely to be made within the existing policy and technological regimes. Methodologically, there has been little progress since the SAR in modeling agronomic adaptations. On the positive side, the adaptation strategies being modeled are limited to a small sample of the many possibilities open to farmers, which may underestimate adaptive capacity. On the negative side, the adaptations tend unrealistically to be implemented as though farmers possess perfect knowledge about evolving climate changes, which may overstate their effectiveness (Schneider et al., 2000). The preponderance of studies finds agronomic adaptation to be most effective in mid-latitude developed regions and least effective in low-latitude developing regions (Rosenzweig and Iglesias, 1998; Parry et al., 1999). However, differences in assumptions and modeling methodology among studies often lead to conflicting conclusions in specific regions. For example, in two studies using the same climate change scenarios, Matthews et al. (1997) simulate large increases while Winters et al. (1999) simulate large decreases in rice yield with adaptation across several countries in Asia. This lowers confidence in these simulations. Like crop producers, livestock managers are likely to implement routinized adaptive techniques that were developed to deal with short-term climate variability during the initial stages of warming. For example, Hahn and Mader (1997) suggest several proactive management countermeasures that can be taken during heat waves (e.g., shades and/or sprinklers) to reduce excessive heat loads. The success livestock producers have had in the past with such countermeasures gives optimism for dealing with future climate change. However, coping can entail significant dislocation costs for certain producers. Confidence in the ability of livestock producers to adapt their herds to the physiological stresses of climate change is difficult to judge. As noted above, the absence of physiologically based animal models with well-developed climate components suggests a major methodological void. 4.3.1.1. Economic Costs of Agricultural Adaptation4. The agricultural cost (both to producers and consumers) of responding to climate change will mostly be for the implementation of measures to adapt. At the individual farm or ranch level, these costs will reflect changes in revenues, while at national and global levels they will reflect changes in prices paid by the consumer. Crop and livestock producers who possess adequate levels of capital and technology should be capable of adapting to climate change, although changes in types of crops and animals that are grown may be required. Two different studies in the U.S. midwest, demonstrate this point. Doering et al. (1997) used a crop-livestock linear programming model linked to the Century biogeochemistry model to show that climate change may cause substantial shifts in the mix of crops grown in the upper midwest, with much less land planted to a corn-soybean rotation and more land devoted to wheat than now observed. Earlier planting of corn increased returns, hence a more frost resistant corn variety was found to be important to farm-level adaptation. Antle et al. (1999) used an econometric-process simulation model of the dryland grain production system in Montana also linked to the Century model (as reported in Paustian et al., 1999) to assess the economic impacts of climate change in that region. Simulations were conducted for baseline and doubled CO2 (Canadian Climate model) with the observed production technology, with and without land-use adaptation and with and without CO2 fertilization. With climate change, CO2 fertilization and adaptation, mean returns change by -11 to + 6% relative to the base climate and variability in returns increases by +7 to +25%, whereas without adaptation mean returns change by —8 to -31% and variability increases by 25 to 83%. There will be important regional variation in the success of adaptation to climate change. It appears that developed countries will be less challenged than developing countries and countries in transition, especially in the tropics and subtropics. Winters et al. (1999) examined the impacts of climate change on Africa, Asia and Latin America using a computable general equilibrium model. They focus on the most vulnerable groups in poor countries: poor farmers and urban poor consumers. The results show that impacts on incomes of these vulnerable groups after adaptation would tend to be negative and in the range of 0 to -10%, as compared to the impacts on consumer and producer groups predicted for the U.S. by Adams et al. (1998), which ranged from -0.1 to +1%. Darwin (1999) reports results disaggregated by region, and also concludes that the developing regions are likely to have welfare effects that are less positive or more negative than the more developed regions. These findings provide evidence to support the hypothesis advanced in the SAR that climate change is likely to have its greatest adverse impacts on areas where resource endowments are the poorest and the ability of farmers to respond and adapt is most limited. At the global level, adaptation is expected to result in small percentage changes in income. These changes are expected to be generally positive for small to moderate amounts of warming, account taken for CO2 effects. The price of agricultural commodities is a good all-around quantity to reflect the net consequences of climate change for the regional or global supply-demand balance and on food security. A global economic model used by Darwin et al. (1995) and a U.S. model developed by Adams et al. (1998) predict that, with the rate of average warming expected by the IPCC scenarios over the next century, agricultural production and prices are likely to continue to follow the downward path observed in the 20th Century. As a result, the impact on aggregate welfare comprises a small percentage of Gross Domestic Product, and tends to be positive, especially when the effects of CO2 fertilization are incorporated. The only study that predicts real price increases with only modest amounts of climate change is Parry et al. (1999). Is there a threshold of climate change below which the global food production system is unimpaired, but above which is clearly impaired? The question can only be answered with very low confidence at this time. Response of prices to climate change provides insight into the question because prices determine the accessibility of a majority of the world's population to an adequate diet. Two of three recent global economic studies project real agricultural output prices to decline with a mean global temperature increase of up to 2.5 °C, especially if accompanied by modest increase in precipitation (Darwin et al., 1995; Adams et al., 1998). Another study (Parry et al., 1999) projects output prices to rise with or without climate change and even a global mean temperature increase of ~1 °C (projected by 2020) causes prices to rise relative to the case of no climate change. When studies from the SAR are combined with the recent ones, there is general agreement that a mean global temperature rise of more than 2.5 °C could increase prices (Reilly et al., 1996; Adams et al., 1998; Parry et al., 1999), with one exception (Darwin et al., 1995). Thus, with very low confidence, it is concluded from these studies that a global temperature rise of greater than 2.5 °C will exceed the capacity of the global food production system to adapt without price increases. Degradation of the natural resource base for agriculture, especially soil and water quality, is one of the major future challenges for global food security. Those processes are likely to be intensified by adverse changes in temperature and precipitation. Land use and management have been shown to have a greater impact on soil conditions than the direct effects of climate change, thus adaptation has the potential to significantly mitigate but may, in some cases, intensify degradation. Such environmental damage may raise the costs of adaptation. Lewandrowski and Schimmelpfinnig (1999) suggest that the increased demand for irrigation predicted by a suite of studies of land and water resources, wild species, and natural ecosystems likely will increase the opportunity cost of water and possibly reduce water availability for wildlife and natural ecosystems. Strzepek et al. (1999) show that some scenarios of climate change may reduce irrigation system reliability in the lower Missouri River in the U.S. Cornbelt, which may induce instream environmental stress. In many developing countries, current irrigation efficiencies are very low by developed country standards. Irrigation efficiency in the Philippines in 1990 was 18% compared to the global average of 43% (ADB, 1998). Some 3,480 to 5,000 L of water are currently used to produce 1.0 kg rough rice (equivalent to 640 g milled rice) in the Philippines (Baradas, 1999) and some neighboring countries. At those irrigation efficiencies, increased irrigation demand caused by climate change would strain irrigation supplies. Hence, one adaptation strategy is to increase irrigation efficiency. Managers of forest resources face a somewhat different problem than those managing shorter-lived crops. In the absence of spatially explicit and transient models of changes in climate, present-day forest management activities - whether it be forest plantation scheduling, silvicultural treatments or any other resource investment activity - are, to many, a speculative proposition because the result of those activities is so dependent on what happens over many decades into the future, at the specific sites being managed. This dependence on future conditions is not new to forest management, of course, but the new factor is the increased certainty of climate change at the global scale with uncertainty about the magnitude, direction and details at the local scale. Increases in locally extreme events (outside the historical norm to which the forest ecosystem and the management infrastructure has adapted) are of particular concern as they are often triggers or exacerbating factors for subtle ecosystem changes that influence successional pathways (e.g., changes in regeneration success and failure) that are are beyond the present capability of management. On the other hand, at the regional and global scales, it is believed that timber and non-wood goods and services will adapt to the changes in forest ecosystems through adjustments in the global market place. At these larger scales, the extent and nature of this adaptation will depend primarily on prices, the relative value of substitute products, the costs of management and advances in technology (Joyce et al., 1995; Binkley et al., 1997; Sohngen and Mendelsohn, 1998). In contrast to the findings in SAR (Solomon et al 1996), more recent studies suggest that climate change will tend to favor rising market share in developing countries (Sohngen et al., 2000). Some suggest that this could happen at the expense of producers in temperate and boreal countries where short-term dieback effects and lower prices may prevail, despite a potential long-term (>50 yr) increase in supply from these regions under some climate response scenarios (Sohngen et al., 2000; Solomon and Leemans, 1997).